IPS is a rapidly growing company hiring at our locations across North America. If you’re ready to do big things, working on the electric motors and generators that keep industry strong and competitive, and helping us drive continuous improvement in everything we do, then we need to talk. 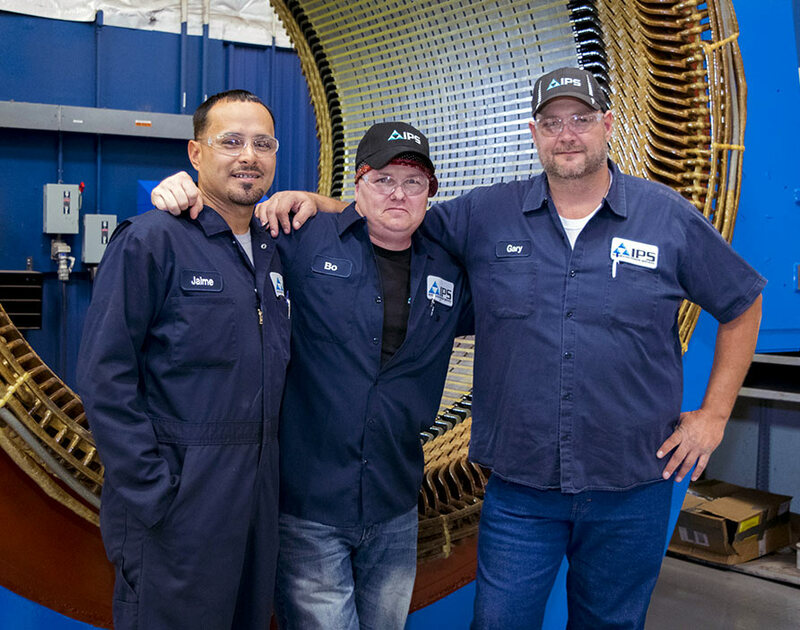 IPS defines world-class electric motor and generator repair on a daily basis — working with us gives you the opportunity to interact with the industry’s best technicians, engineers and service professionals. We’re passionate about what we do and proud of our record of innovation — CIPS (Continuous Improvement Process Solution) is our operating system that guides everything we do and helps us deliver an Unmatched Customer Experience. We offer highly competitive compensation and benefits, with the opportunity for technical training and advancement. You’ll have profit sharing, a 401k and tuition reimbursement. IPS also has a Refer-A-Friend Program with a cash bonus for friends or family members we hire. IPS compensation creates an environment where individuals are rewarded for their commitment to continuous improvement, the willingness to share knowledge and find new ways to solve problems. At IPS we understand that our people are our biggest differentiator and competitive advantage. IPS University offers world-class training and development programs to all IPS personnel. These programs give you the credentials and experience to make more money and discover your potential. We believe our people should reflect the local communities where we live and the people we do business with. Diversity is essential to making us a strong, better company, so we express this commitment in our hiring and advancement. We want the transferable skills and knowledge that former service members bring to IPS, as we salute their patriotism and commitment to service. Join the many military vets who’ve chosen IPS for a civilian career. When you work with IPS, you join a team of people passionate about what they do, where you can learn from industry experts and discover your potential. IPSU provides IPS associates with world-class training and development programs, to attract, retain and develop the industry’s best talent.